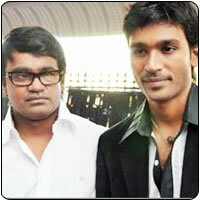 The actor-director duo of Dhanush and Selvaraghavan is back in action again. The brothers who have given smashing hits in the past have joined hands, this time for 'Idhu Maalai Nerathu Mayakkam'. Karthi and Sandhya were initially paired as the lead pair for IMNM which is a dark romantic story. But Selva changed his mind and is now filming IMNM with Dhanush and Andrea as the lead actors. The first schedule of the movie was completed sometime back. The director and the crew members have flown to Hyderabad to can the second schedule of the movie. The music for IMNM is being scored by GV Prakash Kumar. Produced by Selva and Dhanush's RK productions, Idhu Maalai Nerathu Mayakkam is expected to be released in early 2011.